I’ve been meaning for a while to post some more photographs of my Sri Lanka trip earlier this year, and once again to thank the delightful ‘Mr Teddy’ (aka Sanjeewa) and his colleague Jayasinghe for giving me such a magical time. Both Mr Teddy and Jaya work for the Schools Relief Initiative, a charity based in Tissamaharama that was established after the Asian tsunami of 2004. Mr Teddy also runs and leads safaris for Yala Eco Safari. I may have a largely one-track mind, but I do occasionally do things that don’t entirely revolve around food (!) 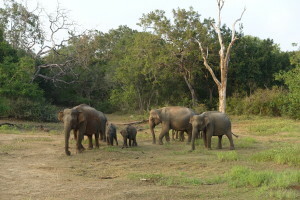 – and two safaris led by Mr Teddy and Jaya were highlights of an altogether incredible trip. 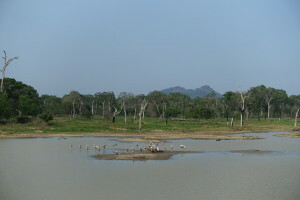 The first was to the Bundala National Park, which is known for its birds. Honestly, I hadn’t expected to find bird-watching particularly interesting, but as we drove through the wild, almost deserted landscape, it was a joy to view the grace and intricacy of green bee-eaters, ravishing little birds that shimmered with iridescent green and blue, paradise fly-catchers, grey-headed fishing eagles and princely jungle fowl, not to mention another dozen or so species that Mr Teddy and Jaya pointed out. We watched raucous crowds of grey langurs hurling themselves around in the trees, and saw crocodiles lurking at the side of a lagoon. Occasionally we spotted macaque monkeys with their sad, ancient faces (the females’ painted in red). And there were water buffalo grazing, and enormous monitor lizards zigzagging lazily across the way. Best of all, we came across a bull elephant snatching leaves and stuffing them into its mouth; we were able to watch it for what seemed like ages, from just a couple of metres away. 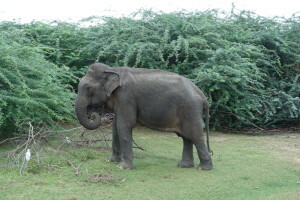 It was one of several wild elephants we saw roaming in the park. As dusk fell, we drove up onto dunes rising over a deserted, rocky beach, where Mr Teddy built a driftwood fire and lit a barbecue. Jaya and I walked down to the shore and watched the waves breaking violently over the crab-scuttling rocks and sucking back into the deep. There was no one else around as far as we could see. Later, we sat on the dunes, gazing into glowing coals as we unwrapped hot parcels of tuna fish, sweetcorn and potatoes while the fire kept any marauding animals at bay. And then we looked up at the star-speckled sky. 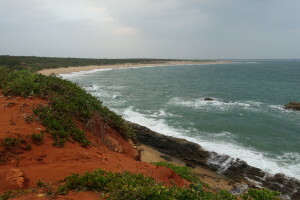 The following day, we headed out to a less-touristy part of the Yala national park for a second safari. We drove through a beautiful and often dramatic landscape where we saw not only several basking crocodiles, many different birds and crowds of langurs and macaques, but groups of wild elephants – at one moment, a family of eight, including two babies. In one narrow track through the forest, Mr Teddy suddenly shut down the engine of the jeep: he’d heard the alarm calls of deer and birds that told him a predator was near… and so we waited, holding our breath, and to our amazement saw a young leopard slinking through the undergrowth next to the jeep, and then crossing the track just behind us. (There are several leopards in the park, but apparently it’s extremely unusual to see one so close.) Later, as sunset approached, we saw two other leopards lurking around, but at a greater distance. As Mr Teddy said (ill-advisedly perhaps, given the company), the day had been a ‘leopard buffet’!